Founded in 1892 in Lancaster, Pennsylvania, but now made in Switzerland, Hamilton draws upon its rich history and the latest Swiss movements and technologies to create aesthetic and innovative designs. 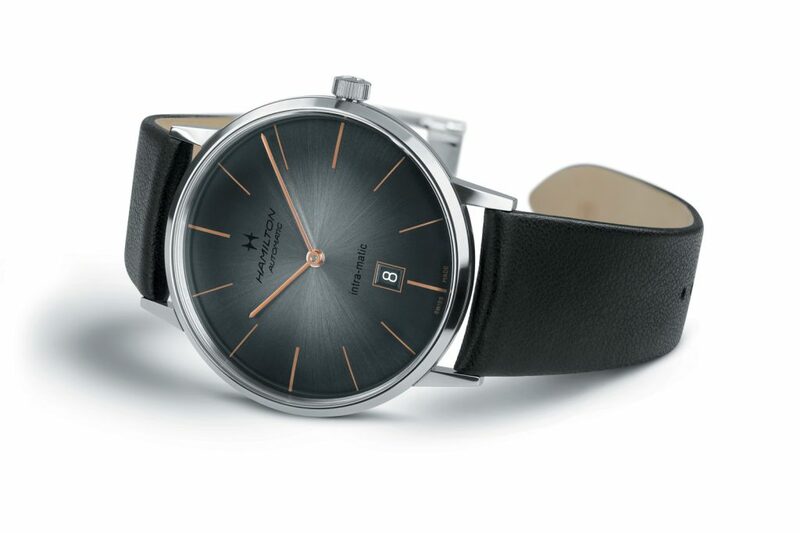 Combining American and Swiss spirit, the new Hamilton Intra-Matic blends genuine vintage style with sleek modern touches. A prime example is the new Intra-Matic Automatic Chronograph, which pulls inspiration from the brand’s 1968 Chronograph A. Also impressive –thanks to their retro styling mixed with warm accents and smoked elements – are the Intra-Matic Classic watches. 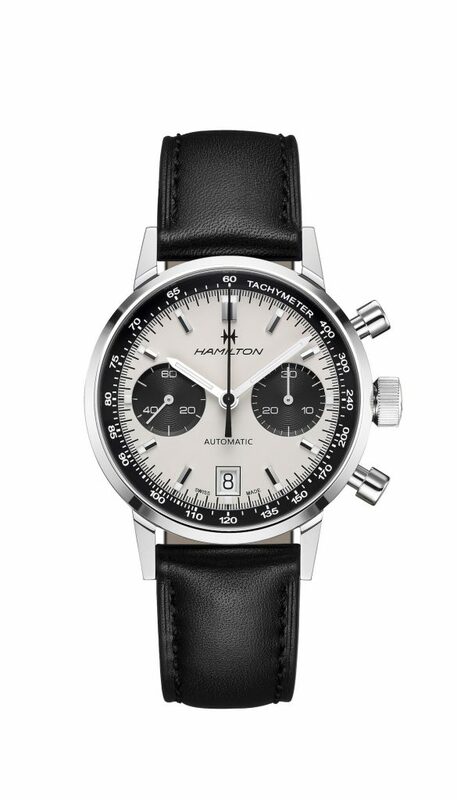 Hamilton Intra-Matic American Classic 42mm watch with smokey gray dial. The Intra-Matic line features four distinct American Classic Intra-Matic styles, available in either a 38 mm or 42 mm case. Each curved dial features gradient coloring that is lighter in the center and increases in intensity towards the outer edges. Dial colors include smokey gray, Havana Brown and smoked Bourbon. 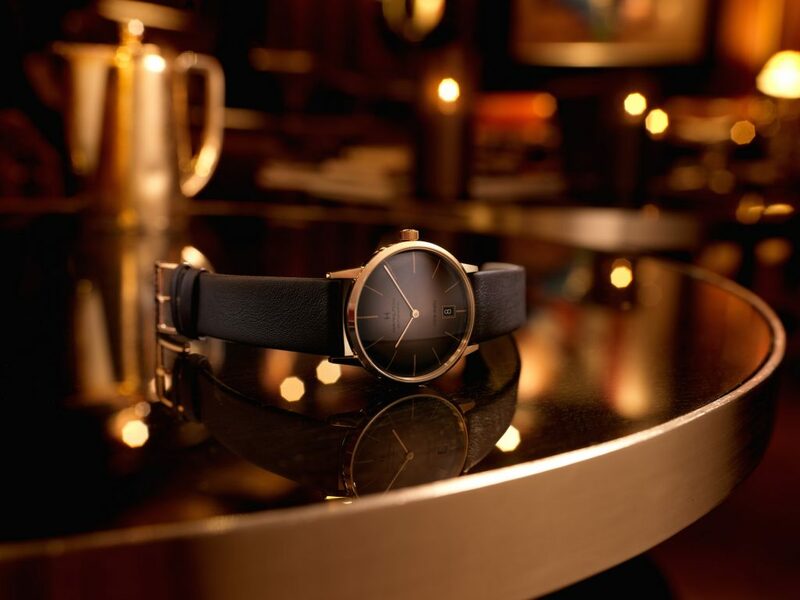 Crafted in stainless steel, or in stainless steel with PVD rose gold coating, the Intra-Matic watches are powered by a slim automatic movement that also offers date function at 6 o’clock. Hand and marker colors are coordinated to match the case. The Havana brown dial version is crafted in a pink gold PVD, while the brighter bourbon-colored dial is offered in a yellow-gold PVD case. The Intra-Matic timepieces are water resistant to 50 meters. The dials on these Intra-Matic watches are superbly executed. The gradient tones offer depth and elegance, and the vintage accents just capture the eye. Making them even more attractive is the price: $895 to $1,145. 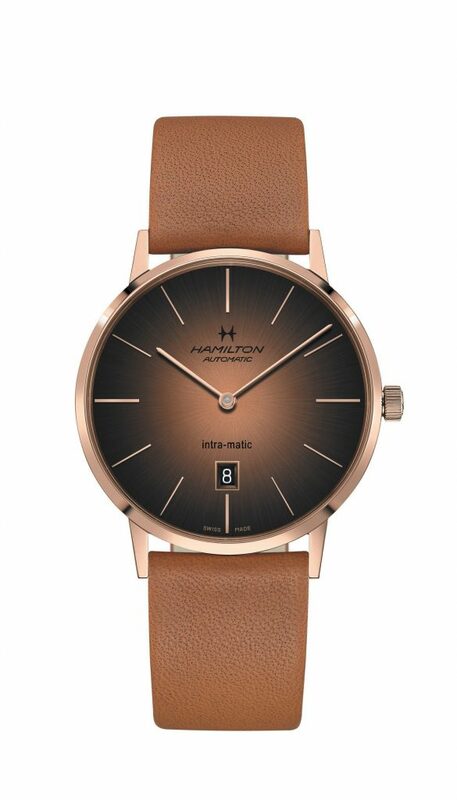 Hamilton Intra-Matic American Classic 42mm watch with smoky bourbon colored dial. Additionally, the Intra-Matic line, as mentioned, includes a great Intra-Matic automatic chronograph. This new 40mm stainless steel timepiece is slightly larger then the 1968 original. With this new timepiece Hamilton retains the authentic late 60s look and feel with updates to reflect more modern tastes. The original panda dial that was made popular in the 60s remains prominent, featuring a white dial with black counters. Even the Hamilton logo across the dial is a replica of the historic version from 1968. The hour and minutes hands are nickeled and coated with Super-LumiNova alongside of the black lacquered seconds hand. White lacquered counter hands pop against the black sub-dials. The Automatic Chronograph houses the exclusive H-31 movement with an extended 60 hours of power reserve and date function. Water resistant to 100 meters, the automatic chronograph sits upon a black calf leather strap. For added comfort and wearability, the Auto Chrono benefits from a soft touch leather strap. The Intra-Matic Chronograph is water resistant to 100 meters. I love the Panda look of this watch, with the classic vintage accents. It’s a winner, especially at $2,195.